The University of Illinois's English Department explains the Great Depression. The Great Depression of 1929-33 was the most severe economic crisis of modern times. Millions of people lost their jobs, and many farmers and businesses were bankrupted. Industrialized nations and those supplying primary products (food and raw materials) were all affected in one way or another. In Germany and the United States industrial output fell by about 50 per cent, and between 25 and 33 per cent of the industrial labor force was unemployed. The Depression was eventually to cause a complete turn-around in economic theory and government policy [I feel another "complete turn-around in economic theory and government policy" is in the works today.]. In the 1920s governments and business people largely believed, as they had since the 19th century, that prosperity resulted from the least possible government intervention in the domestic economy, from open international relations with little trade discrimination, and from currencies that were fixed in value and readily convertible. Few people would continue to believe this in the 1930s. The US economy had experienced rapid economic growth and financial excess in the late 1920s, and initially the economic downturn was seen as simply part of the boom-bust-boom cycle. Unexpectedly, however, output continued to fall for three and a half years, by which time half of the population was in desperate circumstances (map1). It also became clear that there had been serious over-production in agriculture [Not the case today! ], leading to falling prices and a rising debt among farmers. At the same time there was a major banking crisis, including the "Wall Street Crash" in October 1929. The situation was aggravated by serious policy mistakes of the Federal Reserve Board, which led to a fall in money supply and further contraction of the economy. Countries that were dependent on the export of primary products [Primary products = Commodities produced by industries such as farming, fishing, forestry, and mining], such as those in Latin America, were already suffering a depression in the late l920s. More efficient farming methods and technological changes meant that the supply of agricultural products was rising faster than demand, and prices were falling as a consequence [This is not the case today! Consumption has exceeded worldwide food production in the last eight years]. Initially, the governments of the producer countries stockpiled their products. but this depended on loans from the USA and Europe. 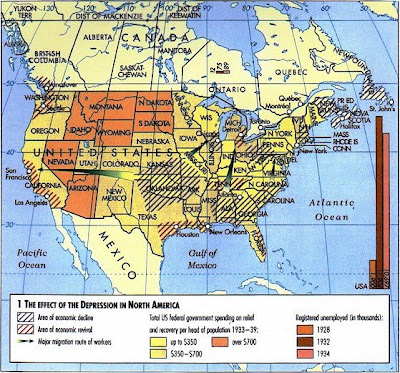 When these were recalled, the stockpiles were released onto the market, causing prices to collapse and the income of the primary-producing countries to fall drastically (map3). 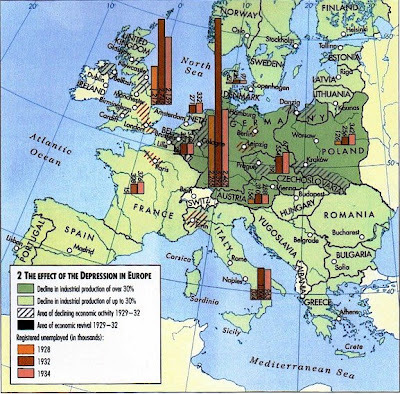 The Depression spread rapidly around the world because the responses made by governments were flawed. When faced with falling export earnings they overreacted and severely increased tariffs on imports, thus further reducing trade. Moreover, since deflation was the only policy supported by economic theory at the time, the initial response of every government was to cut their spending [Today, the polar opposite is happening: governments around the world are printing money]. As a result consumer demand fell even further. Deflationary policies were critically linked to exchange rates. Under the Gold Standard, which linked currencies to the value of gold, governments were committed to maintaining fixed exchange rates. However, during the Depression they were forced to keep interest rates high to persuade banks to buy and hold their currency. Since prices were falling, interest-rate repayments rose in real terms, making it too expensive for both businesses and individuals to borrow. The First World War had led to such political mistrust that international action to halt the Depression was impossible to achieve. In 1931 banks in the United States started to withdraw funds from Europe, leading to the selling of European currencies and the collapse of many European banks. At this point governments either introduced exchange control (as in Germany) or devalued the currency (as in Britain) to stop further runs. As a consequence of this action the gold standard collapsed (map 4). The gold standard linked currencies to the value of g old, and was supported by almost every country in the world. 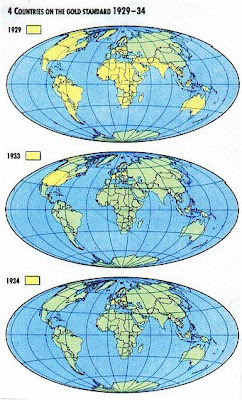 From 1931, however, countries began to leave the standard, leading to its total collapse by 1936. Although at the time this was seen as a disaster, it actually presented opportunities for recovery in many countries, allowing governments to intervene to create economic growth. My reaction: This article highlights some key differences between 1930s and today. In the 1930s: "It also became clear that there had been serious over-production in agriculture, leading to falling prices and a rising debt among farmers." "More efficient farming methods and technological changes meant that the supply of agricultural products was rising faster than demand, and prices were falling as a consequence." Today: 2008 was the eighth year in a row that the world's six billion people have consumed more food than was produced. In the 1930s: "When the American economy fell into depression, US banks recalled their loans, causing the German banking system to collapse." "In 1931 banks in the United States started to withdraw funds from Europe, leading to the selling of European currencies and the collapse of many European banks." Today: The US owes the world between 4 and 5 trillion dollars. Ironically, it might be German banks recalled their loans which causes the US financial system to collapse. In the 1930s: In response to falling food prices, the governments of the producer countries stockpiled their products using loans from the USA and Europe. When these loans were recalled, the stockpiles were released onto the market, causing prices to collapse. Today: The world's food stockpiles are at their lowest in 37 years (enough to feed the planet for about 55 days). In the 1930s: "The gold standard linked currencies to the value of gold, and was supported by almost every country in the world." Today: No currency is redeemable in gold. In the 1930s: "Since deflation was the only policy supported by economic theory at the time, the initial response of every government was to cut their spending"
Today: The response of every government has been to boost spending (Keynesian economics at their finest). The threat of deflation today is imaginary. Everything points to some serious inflation in the near future. This entry was posted in Background_Info, Currency_Collapse, Euro_Zone, Food_Crisis, Gold, Wall_Street_Meltdown. Bookmark the permalink. Eric, you seem certain that hyperinflation could come to the U.S. soon. How would you respond to this article http://www.marketoracle.co.uk/Article9409.html ? This guy seems pretty confident that it's impossible. Not much to respond too really. The only point he makes in the entire long winded article is that the US might go to war. It's not obvious to me (and he doesn't explain) how this would prevent hyperinflation. Hi Eric, it looks to me that this in terms of our food production that they have learned the lesson of the 30's ie heading into a depression it's not a good idea to have an oversupply of food as this makes the deflation worse. Thus by having an under-supply they can possibly engineer inflation in food prices to offset deflationary forces elsewhere, perhaps this will create other problems however? Eric, I also believe that we are currently in a deflation at the moment - which is being dangerously fought with a massive Keynesian expansion of the monetary base, to encourage inflation to appear again. So the monetary spring is being wound tighter and tighter, eventually to explode - when all confidence is lost - into sudden hyperinfation. The first or initial trigger of this hyperinflation - with the US being the biggest debtor on the planet now - will most likely to be due to external factors. And in my readings, many say that America is likely to go to war rather than suffer hyperinflation and collapse. How likely is this scenario do you think? Who are we supposed to go to war with this time? Obama is not a militaryt man and I don't think will push us to war. I thought about making this short but I can�t. It�s probably best that I didn�t. Some of you responding don't realise that the govt. is not trying to inflate the prices of things but the price of debt(credit) because the price of things and the price of debt move in opposite directions. So in actuality the govt. by printing all this money is trying to stop prices of food and things from rising NOT dropping. We don't have a problem with prices of things dropping, we have a problem with prices of things rising and the govt. knows this and is trying to stop it from happening by bringing back the desire(demand) to lend. But one can only lend if they have savings and the banks are insolvent. The banks are insolvent because credit moves/grows faster than the creation/movement of dollars and coins. Since the demand to lend is being stymied by insolvency, the value(price) of debt(lending) is dropping. There is now less demand to lend while the supply of people that need to borrow has stayed the same or grown. Infact because the supply of people that need to borrow has grown, the demand to lend had to grow in order to save the Fractional Reserve Banking system. If the demand to lend did not grow, the value of lending(debt) would decrease making the value of things people can't afford without borrowing rise therefore making the value of the dollar decrease and potentially ending the Fractional Reserve Banking System especially with the amount of borrowing that is needed to supply the things people need because of lack of production. And because while easy lending was going on meaning the value of debt was high(in high demand), the value of other things was too low and when the value of something is too low it discourages production. So you see credit is like a cancer, it's growth causes it to grow more and more but the more it grows the closer it is to it's end: insolvency. Credit is inherently self destructive because it discourages the production of other things, causing those things to be in shortage, causing the price of those things to eventually rise then causing more people to feel the need to borrow to have those things. And because credit must always be backed by something tangible (today it's the Federal Reserve Note and other paper currencies) since we use computers and the internet for transactions that can transfer numbers from one part of the world to another allot faster than the Federal Reserve Notes and coins can be printed/minted and transported to that same place insolvency is inevitable. And I can't think of any form of tangible exchange that takes less energy to create than printing paper and that's why proponents of Fractional Reserve Banking(lending) chose paper to be money. It's the exact opposite of what you want to be money when that lending ends(and it inevitably does through insolvency). When that lending ends the value of debt will decrease while the value of things rise. What you want to be money after lending has stopped is something that is hard to produce, so as to be able to store your wealth. Things that are hard to produce can not work in a Fractional Reserve Banking System because insolvency would happen very quickly as there wouldn't be enough of that rare product to lend. Proponents of FRB would much rather you buy paper gold than physical gold. They never really cared about the money though(whether it be gold, silver or paper), they just cared about the system, the Fractional Reserve Banking system which gave them power as they controlled the money and could do with the money what they wanted. I also think this Fractional Reserve System was an attempt at socialism and eventually dictatorship but those things inherently fail too. But this may not even be an issue of total control by some govt. elite. All of this may just be part of the free market. The free market is always in control and our adoption of a Fractional Reserve Banking System may just have been part of the free market. I'm sure if gold/silver became too rare to use as money people would be saying that gold/silver failed as money. That's why i support no standards, I know the free market is always in control and I just choose to store my wealth in what looks best to store wealth at the time, notice i said "at the time". You just have to keep your eyes open and on the supply and demand status of things and realize that life is a gamble. Where you choose to store your wealth is always a risk, so don't be lazy letting someone else control where you store your wealth. Keep your eyes on where you store your wealth and you should be able to succeed in storing your wealth. And when the govt. does things to try to hinder people from keeping their eyes on where they store their wealth like discontinuing the publishing of M3, this only makes that store of wealth look more risky. No one wants to store their wealth in something they can't see the supply of to see whether it's a safe store of wealth or not. You should know the supply/demand fundamentals of where you store your wealth if you want that wealth to be stored. But there are allot of people who are lazy and don't keep their eyes on the supply of their store of wealth. Allot of people don't realize that when lending ends you don't want to store your wealth in portable things that are easy to produce(paper), you want to store your wealth in portable things that are hard to produce(gold/silver). But allot of people (in the face of deflation and credit collapse) are running to US Treasuries which are just paper that promises to pay paper. When credit collapses and the price of those things which are hard to produce start rising people will run away from those things that are easy to produce and to those things that are hard to produce as a store of wealth. And even though it will seem like the demand for dollars should increase because of the credit contraction, the credit contraction hurts the production of other things more than it hurts the production of dollars. The credit contraction (freeze in lending) exposes the shortage of other things. It exposes how hard it is to produce those other things in comparison with producing dollars. For decades we have been trading the production of paper to other nations for the production of things, things that are much harder to produce than paper. The imbalance(trade deficit) is so large we�ve been practically getting things from these other nations for free. The demand for other things will outweigh the demand for dollars because dollars will be needed to produce those other things as all that's needed to produce dollars is a printing press. So there'd be nothing hindering the production of dollars but because of the enormous credit contraction due to the enormous debt, there'd be a huge hindrance in getting the dollars needed to finance production of other things and most importantly stopping the production of dollars will only make it harder to finance production of other things so it's a loose-loose situation for the dollar and Fractional Reserve Banking. and save the Fractional Reserve System destroys the dollar and the idea of using something that is easy to produce as a store of value and again Fractional Reserve Banking can not last long using something that is hard to produce. So it's a loose-loose situation for paper money and Fractional Reserve Banking. Inflation won't come all at once or evenly. Basic necessities such as health care and food will inflate probably first. This will make inflation of non-essentials almost impossible. Indeed, it wouldn't take much further inflation in health care and food to actually cause deflation of everything else. Actually, I firmly believe that unrelenting healthcare inflation may have caused the housing boom to bust and started this mess in the first place. It is possible to consume food that was stocked from overproduction in the past. I hope you do not really believe that the only way for the fed to inject liquidity into the system is physically (by minting/printing)??? The fed can also inject digitally and hence there is at least no technical limit to the speed of their injection. In theory it seems indeed possible for hyperinflation to arise, but between now and that actually happening there are a few steps. After all what we are currently seeing is closer to deflation than to inflation (let alone hyperinflation). Should the first sparks of huyerinflation start igniting the government could still take action and for instance drastically reduce the money supply. Now lots of people might state things as "I do not believe they will do that", but so far it does not seem impossible for them to actually do so. Therefore, I would really appreciate someone explaining why the government should be totally powerless at the moment the current deflationary trend reverses. In other words: is hyperinflation really guaranteed?? The FED has tools to control inflation and deflation. However, these tools are IMHO too generic. You can see that by looking at the effects of their bank bailouts: they are still struggling to get the money where they deem it neecessary. Basically, the problem may be compared somewhat to a property of Austrian economics: inflation, for example due to innovations that lead to higher efficiency and therefore to better competetiveness and therefore to a concentration of money in the hands of a small group, is not a balanced effect. It (usually) slowly takes its way through the economy: the regular worker profits from it (typically) as the last one. We can now translate that to the FED: the FED may enlarge or reduce the capital base of the banks, but it cannot control the myriad economic consequences that has for the economy. As the money is sickering into the wrong pockets right now at AIG, it will be redeemed from the wrong pockets when the FED tries to take it away. I think the reduation of bank capital will again lead to many bankcruptcies throughout the economy. IMHO the FED currently concentrates on fighting the deflation of bank assets. However, there are more important parts of the economy that could be hit hard by applying such a priority to these assets. Let us assume the actions of the FED solve the housing problem somewhen. What to do afterwards? There will be many many home owners deep in their debts. Reflating the system would imply to put them into default again. So the FED could be locked up in its actions. But due to its sledge hammer like tools, the reduced pressure on banks will most certainly lead to more misuses of their new money -- that cannot be taken out of the system because the money to mortgages would be reduced first or synchronuously. Where would that misused money go? I don't know. It would be put to work somehow -- and thereby leading to the inflation. So we could end up with inflation due to money leaking out of the life support programs for the banks and financial institutions. What you are saying could certainly happen. However, if I am correct you are talking about a scenario where the fed gets control of the current problem to some extend, but not without some unintended consequences such as money leaking off creating inefficient use and inflation. What I was referring to is however the scenario of hyperinflation. As all scenario's that one too has a real change of coming true, but opposed to how it is often presented the scenario is not guaranteed to play out. I believe that between the contemporary situation and hyperinflation are certain steps during which the fed (and other parties) can still step in and prevent the path to run its course. You see I've heard this before but it doesn't make sense to me. The whole reason behind a bailout is insolvency, meaning the banks or institutions don't have enough physical dollars to continue lending or to some level provide deposits and thus banks go bankrupt and credit contracts. Increasing the money supply without increasing the supply of physical dollars would only cause the banks or institutions to default quicker. I don't understand what a "digital bailout" is. When you lend money, you increase the money supply because in Fractional Reserve Banking we try to have our cake and eat it too. We try to make money be at more than one place at the same time. It works until the debt to physical dollar/asset ratio gets way out of control and way too large. Too many people have claim to the same asset, the end result is default. Some people I respect intellectually have also said these bailouts are digital. It makes no sense to me. I think they are misinformed. These bailouts have to be backed by tangible assets(Federal Reserve Notes) and the truth is there are not enough assets(Federal Reserve Notes) on earth and that's why we are facing defaults and why these bailouts are going on. In a Fractional Reserve Banking System being on a paper standard is no different than being on a gold standard except that when defaults near it's easier to stop defaults on a dollar standard than on a gold standard as it is allot easier to produce paper dollars than it is physical gold. But even paper dollars has it's limits if you plan on keeping a cap/limit on the largest denomination of those dollars(meaning if you don't plan on making any larger bills than $100 bills). The debt can grow so large that $100 bills won't be able to be produced fast enough to stop defaults. When this happens the govt. is forced to increase the denominations of currency (ala Zimbabwe/Weimer Republic), where bills of up to $1 trillion dollars are created to stop defaults. This is why larger bills are created, because of debt that's too large for the current denominated bills to cover. It's not even an attempt at saving the system because once the debt gets too large, the system is done. If they allow defaults the desire of storing your wealth in a third parties keeping(banks) is destroyed and Fractional Reserve Banking can not work without third party storage(banks) and if they try to stop defaults (the only way is by printing more dollars) then they destroy the desire of using things that are easy to produce as a store of wealth (which is the only way Fractional Reserve Banking can work without facing defaults.) So if they default then Fractional Reserve Banking is destroyed and if they try to stop defaults then Fractional Reserve Banking is destroyed. And this is because too much debt is the inevitable result of a Fractional Reserve Banking System. Re-inflation will in all likelihood be very selective and uneven. Certain basic necessities such as health care and food, etc. will probably inflate far more readily than non-essential things. I frankly see a situation where flooding the system with money could possibly cause essential things to inflate while actually causing many non-essential things to DEFLATE even faster than at present. I certainly would expect, for example, if health care and food and other basics started to rapidly inflate that prices of houses would actually deflate faster than even at present simply because owning a house is in hard times a luxury. A World governing body made owning gold onerous? Could the AIG bonus fiasco play into any benefit from a commodities rise? That the 15 fold increase in the domestic money supply translates to a 10 fold increase in golds price/oz(Gibsons Paradox, Greshems Therory bad, chases good)? If so what bars a high tax or other such penalty/duty on physical precious metals owners? Now since the valve has been opened(money supply expansion/inflation)what would you or could you suggest? A Fiat money supply in addition to the curse of a infinite numerical capacity also would seem to have an infinite number of consequences and perils. Thank you for your informative piece.